God's Not Dead is a 2014 American Christian drama film directed by Harold Cronk, and stars Kevin Sorbo, Shane Harper, David A. R. White and Dean Cain. The film was released to theaters on March 21, 2014, by Pure Flix Entertainment. The film follows an evangelical Christian college student (Shane Harper) whose faith is challenged by a philosophy professor who declares God a pre-scientific fiction. that brought me here right now. to change your final answer. He says no a lot. your thoughts,' says the Lord." your faith in Jesus Christ?. and ask him into your life. is just accept his Son. or anybody else here does. I was reading an article online about how religious films influence an estimated 200,000,000 Americans, including unsaved Jews and Mormons. In my opinion that's why the film's writer(s) are intentionally vague concerning the Gospel, as to avoid offending any particular religious group. Sadly, it appears that the film's producers are more interested in making lots of money than they are getting people saved. 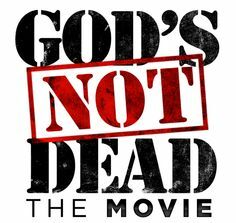 There is nothing in the movie “GOD'S NOT DEAD” that would offend an unsaved Jehovah's Witness, Mormon, Seventh-Day Adventist, Roman Catholic, Lutheran or other demonic religion. The vague teaching of accepting Jesus is a false plan of salvation, because that is not the Gospel as taught in the Holy Bible. The Biblical plan of salvation excludes all forms of self-righteousness and human effort. Every Catholic believes in accepting Jesus, and they are all going straight to Hell to burn!!! 'God's Not Dead' Film Fails to Mentions Christ is Risen! Ironically, the name of the religious movie is “GOD'S NOT DEAD,” yet the film fails to mention Christ's bodily resurrection from the dead. Do the film's writer(s), actors, director and producer believe that Jesus is alive? Is God alive but Jesus dead? The film does contain one actor (a student) professing that JESUS IS GOD! That's true and good! But it strikes me as odd that a religious film which aims to promote the truth that GOD'S NOT DEAD, would fail to promote the Biblical truth that Christ's tomb is empty, because JESUS IS RISEN!!! Not one mention of Christ's resurrection is made in the film. Why not??? My friend, JESUS IS NOT DEAD, and He has RISEN BODILY from the grave and then He BODILY ASCENDED into the clouds for His disciples to witness (Acts 1:9-11). Please read, What Is The Gospel? (an excellent sermon by Dr. Harry Ironside; few churchgoers get it right!). Few religious people (I dare not call them Christians) get the plan of salvation correct. Today's religious radio stations are absolutely saturated with theological garbage and nonsense. I heard Evangelist David Platt the other night pleaded emotionally for listeners to get saved, but all he kept saying was to merely trust Jesus. My friend, even the devil's believe, but tremble in fear (James 2:19). You cannot get to Heaven by just trusting Jesus. You must believe that Christ died on THE CROSS for YOUR SINS, and that He was BURIED (officiating His death), and that Christ bodily RESURRECTED on the third day from the dead. This is the Gospel and you cannot be saved without it. No one can be saved who denies Christ's bodily resurrection from the dead. No one can be saved who trusts in Jesus, but does not believe that Jesus suffered, bled and died on the cross for their own sins. No one ever got saved who didn't know that he or she is a guilty sinner in God's eyes!!! In the film, James A. R. White never asks the dying atheist man if he knows that he is a sinner. That is a critical error. White says in the film that God is willing to forgive the man of his sins, but the question is never asked, “Do you know that you are a sinner?” You'd be surprised how many people DON'T think they are a sinner. The nation of France years ago published a statement that they were not sinners; but rather, merely had some imperfections. Well, the French are all filthy, rotten, guilty, hell-deserving, SINNERS, according to God (Romans 3:23). Notice in Matthew 7:21 that these are the reprobate Lordship Salvation crowd... “LORD, LORD”; yet they failed to do God's will, which is found in John 6:40, “And this is the will of him that sent me, that every one which seeth the Son, and believeth on him, may have everlasting life: and I will raise him up at the last day.” This speaks of God's imputed righteousness which comes only through faith in the Gospel of Jesus Christ (Philippians 3:9; Romans 10:3-4; 2nd Corinthians 5:21; Romans 4:5-6). “Seeing the Son” means you have the correct Jesus, not the Jehovah's Witness and Seventh-Day Adventist Jesus (who they say is Michael, the archangel). You can trust “Another Jesus” (2nd Corinthians 11:3-4) all you want, but you'll never be born-again. Trusting Jesus means nothing unless you believe that He died for your sins on the cross, and raised-up from the grave three days later. You had better “Repent ye, and believe the Gospel” (Mark 1:15). “Repent” here means to “change your mind” so you'll come to Christ to be forgiven and saved. Repentance is not reformation. It is not forsaking sinful bad habits nor giving up the world. Repentance is realizing that you are an awful sinner in God's holy eyes (Romans 3:19); thus, you are compelled to believe the Gospel to be saved. Matthew 21:32, “For John came unto you in the way of righteousness, and ye believed him not: but the publicans and the harlots believed him: and ye, when ye had seen it, repented not afterward, that ye might believe him.” Notice that the object of repentance is believing, and not a change of lifestyle. The man who repents believes! You can believe the Gospel and still not be saved if you fail to understand that you are a wretched sinner for breaking God's commandments. You've got to know what you're being saved from. Salvation is not making a commitment to serve God, nor is it inviting Jesus Christ into your life or heart, nor is it straightening your life up with God's help. I hear so many false plans of salvation on radio programs these days. Without preaching against sin, there can be no true salvation. Salvation is only for THE UNGODLY (Romans 4:5-6). Those who are whole have no need for The Great Physician (Jesus, the resurrected Christ). The bad news is that you are a dirty sinner, deserving of God's everlasting punishment in Hell, fire and damnation (Romans 3:10,23; 6:23; 2nd Thessalonians 1:8-9; Revelation 20:12-15). But the good news is that God, in His unconditional love, sent His only begotten Son into the world to pay the sin-debt that we all owed. Jesus paid it all! Christ paid a debt that He did not owe, because we all owed a debt we could not pay. If you will receive Christ's sacrifice on the cross as full-payment for your sins, believing that Jesus raised-up the third day, then you will be immediately and forever born-again. You can never lose your salvation. How can you lose that which was not yours to give in the first place? If saved, always saved!!! Eternal life is a free gift (Ephesians 2:8-9; Romans 5:15,18; 6:23). You cannot take any particular Scripture passage out of context. We see the Gospel plainly defined for us in 1st Corinthians 15:1-4, as I have just shared with you. Judas followed Jesus, being one of His very apostles; yet, Judas died in his sins and went tot Hell forever. Matthew 27:3 tells us that Judas even repented, but it wasn't repentance toward God. Judas was sorry that he got caught betraying the Lord, and he felt remorse, even trying to return the 30 pieces of silver. In a frantic panic attack Judas went and hung himself from a tree. Religion is not salvation. A demon's favorite activity is making people feel comfortable in religion, without ever being born-again through faith in the Gospel. Whether or not you CHOOSE to follow Jesus and live a consecrated life for Him is an entirely different matter than salvation. Two important Biblical words concerning salvation, that the heretical Lordship Salvation crowd always avoid, are the words “GIFT” and “IMPUTATION.” I'm tired of hearing everything but the Gospel from churches, religious radio, Bible colleges and preachers on how to get to Heaven. Here's some junk that a local Baptist church passed out last Christmas, leaving out Christ's resurrection. They added public confession of Jesus to be saved. That is false doctrine. You don't have to confess Jesus' name before men in public to be saved. The film “GOD'S NOT DEAD” teaches repeatedly during the film that if you confess Christ, He'll confess you. The Lord is NOT giving a plan of salvation in Matthew 10:32-33, “Whosoever therefore shall confess me before men, him will I confess also before my Father which is in heaven. But whosoever shall deny me before men, him will I also deny before my Father which is in heaven.” Biblical evidence that this is not a plan of salvation is found in John 12:42-43, “Nevertheless among the chief rulers also many believed on him; but because of the Pharisees they did not confess him, lest they should be put out of the synagogue: For they loved the praise of men more than the praise of God.” As you just read for yourself, many of the Jewish chief priests BELIEVED on Him, but they DID NOT CONFESS HIM, for fear of the self-righteous, Christ-hating, religious, Pharisees. Confessing Christ is NOT a requirement to be saved. 1st Corinthians 15:1-4 defines THE GOSPEL for us. 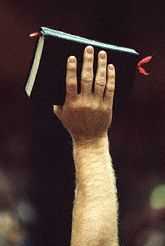 Billy and Franklin Graham are false prophets, who requires public confession as a requirement to be saved. All across the world today, there are heathen religious groups who are attempting to attain righteousness by the works of the law. I'm talking about even some independent Baptists today, who have fallen victim to the Devil's lie of Lordship Salvation and others wrong repentance (aka, the “turn from sins” heresy prevalent in the churches today). Biblical repentance is admitting that you are a guilty sinner in the eyes of a holy God, judging yourself as a needy sinner in God's sight (Romans 3:19-20). Repentance IS NOT self-reformation, where you turn away from sinful ways, or forsake sinful bad habits, nor is it a sincere desire to turn away from sins, as some false prophets teach (Matthew 27:3). When you get saved BY FAITH alone (Galatians 3:26), the Holy Spirit comes to indwell (live inside) your body (1st Corinthians 3:16-17), and then the Holy Spirit changes you (2nd Corinthians 5:17). God's presence (the Holy Spirit in us) changes us, IF WE YIELD to the Spirit in us (Galatians 5:22-25). Galatians 5:25, “If we live in the Spirit, let us also walk in the Spirit.” That is, if WE ARE SAVED, we should OBEY THE HOLY SPIRIT because we are saved. The Bible never says we “shall” or “must” yield to the Holy Spirit, it says we “should.” Ephesians 2:10, “For we are his workmanship, created in Christ Jesus unto good works, which God hath before ordained that we should walk in them.” Beware of anyone who tells you that you must turn away from sinful living as evidence that you have truly been saved. That is the lie of Lordship Salvation!!! Forgiveness of sins, which includes eternal life, is a free gift from God (Romans 6:23). Jesus doesn't forgive sin. That is correct! Jesus has already paid for everyone's sins. Hence, it is a gift. You get saved by receiving what Christ did on the cross to pay for your sins, believing that He raised up three days later. By placing your full confidence in Christ's sacrifice on the cross for your sins, trusting Him because you accept by faith that He has risen from the dead, you are born-again immediately and saved eternally.